The horizontal lines of feeding holes in tree trunks made by the Yellow-bellied Sapsucker are likely more familiar to people than the woodpecker itself. The sapsucker feeds on the sap that flows into these holes and it maintains them daily to ensure sap production. 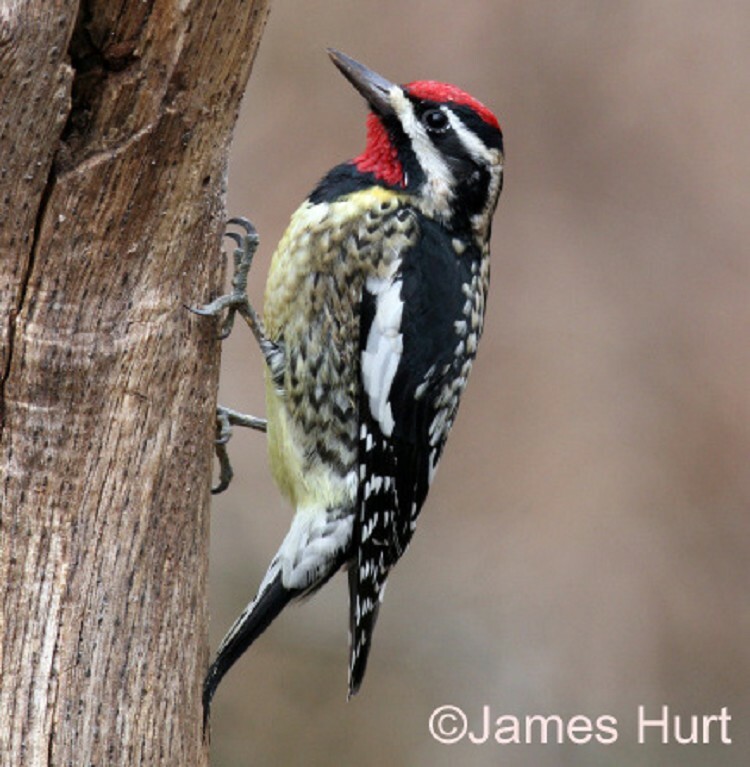 This woodpecker is faily common in Tennessee during the non-breeding season, but is one of the rarest breeding birds in the state as it is restriced to a small area in the high-elevation forests near the North Carolina border. The breeding range of the Yellow-bellied Sapsucker extends across Canada to the northeastern United States, with an isolated population in the Appalachian Mountains of Virginia, Tennessee, and North Carolina. It migrates to the southeastern states southward to Panama and the West Indies in winter. Description: The most distinguishing field characteristic of this medium-sized woodpecker is the vertical white stripe running down its side. The head has a bold pattern with forehead and crown red, bordered by black, and a black and white stripe on the face. The upper chest is black, the belly is yellowish, and the back has messy black and whitish barring. The sexes can be distinguished with the male having a red throat, while the female has a white throat. The juveniles (July-March) have a similar plumage to the adult, but lacks red on the head, and is brown where the adult is black. Voice: The call is a nasal down-slurred mew. The drumming of the Yellow-bellied Sapsucker is a distinctive series of 5 rapid taps followed by slowing taps. No other woodpeckers have a vertical white stripe on the side. Breeds in young forests and along streams, especially in aspen and birch. Winters in a variety of forests, especially semi-open woods. Diet: Sap, fruit, arthropods. Also eats tree cambium. Nesting and reproduction: Male and female show strong territorial fidelity year after year. Clutch Size: 5 to 6 eggs, range from 3 to 7. Incubation: Both parents incubate the eggs for 12 to 13 days. Fledging: Nestlings leave the nest after 25 to 29 days. They are fed insects, often mixed with sap, by both parents. The young begin feeding on sap in about 2 weeks and stay with the adults for several more weeks. Nest: A new cavity is excavated each year and takes about 3 weeks to complete. The same tree is frequently used in subsequent years. Status in Tennessee: The Yellow-bellied Sapsucker is fairly common across the state during the winter, but is an extremely rare breeder. Tennessee is at the southern limit of the breeding range and it is generally found between 3,400 and 4,600 feet elevation in the high mountains of Johnson, Carter, Unicoi and possibly Greene Counties. The Yellow-bellied Sapsucker is listed as a bird In-Need-of-Management in the state due to its limited breeding distribution. The number of breeding pairs of the Yellow-bellied Sapsucker has declined in recent years and there have been few recent breeding season records. The isolated population of Yellow-bellied Sapsuckers in the Appalachian Mountains of Virginia, Tennessee, and North Carolina is considered a distinct subspecies called the Appalachian Yellow-bellied Sapsucker, Sphyrapicus varius appalachiensis. The Yellow-bellied Sapsucker is the only migratory woodpecker in eastern North America. Some individuals spend the summer in the southern part of the breeding range but the majority travel to Central America. Females tend to migrate farther south than do males. Ruby-throated Hummingbirds appears to have a close relationship with sapsuckers. They sometimes place their nest near a tree with sap wells, and either feed on the sap or the insects that are attracted to the sap. They may even time their migration to coincide with that of sapsuckers. As with other species of woodpecker, the nest cavities that Yellow-bellied Sapsuckers excave often provide nesting or roost sites for other species of birds and even some mammals (e.g., northern flying squirrel) that cannot excavate their own cavities. Best places to see in Tennessee: In winter this woodpecker can be found in lower elevation forests across the state. During the breeding season, it might be found in the highest elevations of Johnson, Carter, Unicoi and possibly Greene Counties, near the North Carolina border. One site in particular is Sam's Gap in Unicoi County. Walters, E.L., E.H. Miller and P.E. Lowther. 2002. Yellow-bellied Sapsucker (Sphyrapicus varius ), The Birds of North America, No. 662 (A. Poole and F. Gill, eds.). The Academy of Natural Sciences, Philadelphia, PA, and The American Ornithologists' Union, Washington, D.C.